What are the Benefits of Preventative Maintenance for Water-Activated Tape Dispensers? Water-activated tape, also commonly known as gummed tape, is an effective carton sealing solution that forms a strong and permanent bond. Water-activated tape (WAT) literally bonds to corrugated cartons. For your business, adhesion is important. It means your products stay safe in transit, and saves time and money in the shipping process. Since WAT requires a dispenser to wet and cut the tape efficiently, you will need to perform a few simple maintenance tasks to make sure that your company achieves these advantages consistently. You may wonder why these tasks are required? This post offers an overview of the benefits of preventative maintenance for water-activated tape dispensers. A water-activated tape dispenser’s water brushes and shear blades require the most frequent maintenance. Brushes should be cleaned weekly to maintain moistening effectiveness. Wash them well in warm water with mild soap and rinse well. Shear blades need to be free of dust adhesive and dust to cut well. They should be cleaned monthly by removing accumulated glue from the blades using a scraper. (Take care not to scrape the cutting edge, or the blade may become dull.) Performing these simple maintenance tasks will ensure that the tape will have a clean cut, adhere well to your carton and allow your employees to be most productive. 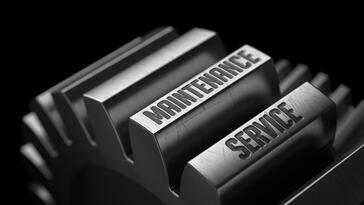 Regular maintenance keeps your machine running smoothly and helps to avoid significant repairs over time. Keeping up with maintenance will keep your WAT dispenser running smoothly and save you money in the long run. Keeping your machines clean and functional is important to maximize your dispenser’s life expectancy. A well-maintained WAT dispenser typically lasts for well over 15 to 20 years and this life expectancy can be enhanced with preventative maintenance. Without preventative maintenance, the useful life of your dispenser can be compromised and you might incur the expense of purchasing a replacement prematurely. If you have any immediate questions regarding the condition of a Better Pack water-activated tape dispenser, call (203) 926-3700, or fill out a form on this page. Alternatively, one of our other posts, "What if My Gummed Tape Dispenser Is Not Functioning Properly", covers some of the common issues associated with WAT machines. When your Better Pack or Intertape WAT dispenser needs repair, you can send it directly to the Better Packages manufacturing facility in Ansonia, Connecticut, USA. Alternatively, many of Better Packages Authorized Distributors handle service and repairs. They maintain an extensive parts inventory and use only genuine Better Packages replacement parts. Download the free ebook below for tape dispensing packaging solutions.